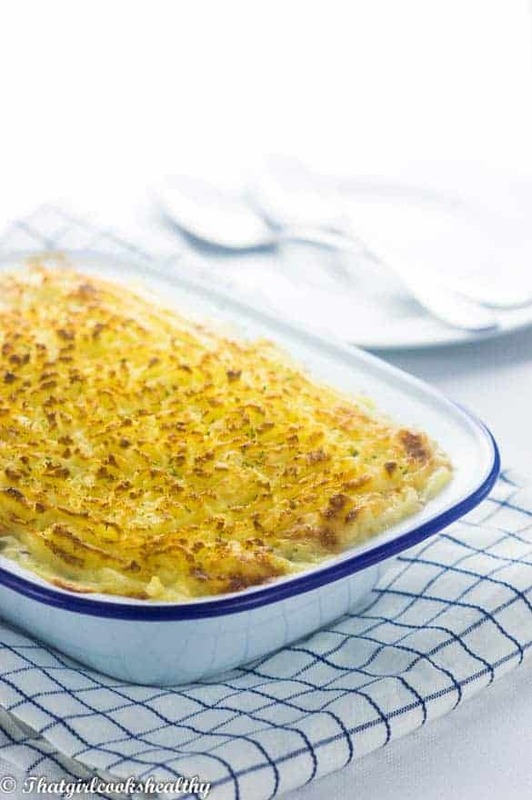 sweet potato fish pie – A dairy free spin on a British dish with chunks of fish in a creamy white sauce with callaloo and sweet potato cheesy topping. 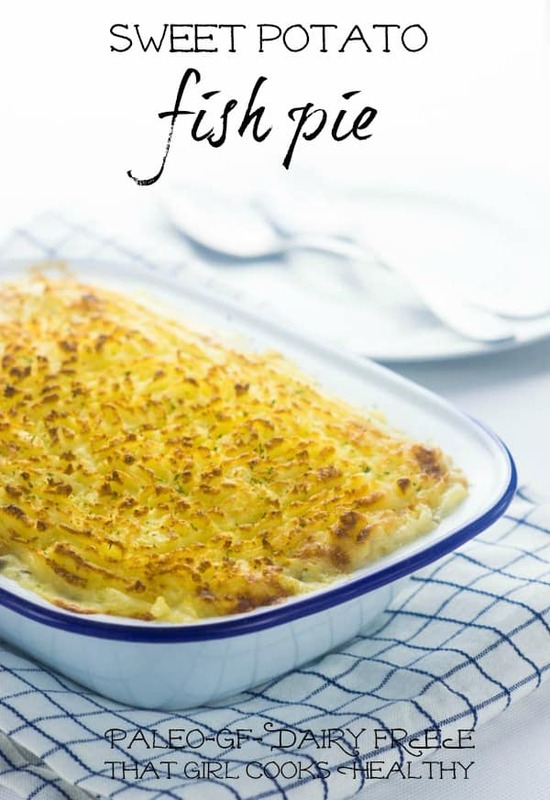 If you’re looking for a healthy and wholesome weeknight meal then I would highly recommend giving this sweet potato fish pie a try. The great thing about this recipe is the fact it’s free from dairy and naturally gluten free. It wasn’t very hard to replace the cows milk with plant based milk. As a result I whipped up this award winning creamy white sauce. The one thing that concerned me the most was how to use coconut milk to form the white sauce and disguise the overpowering taste of coconut. black pepper and himalayan pink salt. I feel that the aforementioned helped to infuse the coconut milk with a rich and creamy taste – one free of coconut (I promise). I know how daunting it can be when you’re cooking something that contains dairy and you’re either browsing the web or scrutinizing the supermarket shelves for a viable or foolproof dairy free substitute. That’s why I strive to be that blogger who ensures all my dairy/gluten substitutions have been tested several times to make sure they hold up. I do this so you, my lovely readers can trust that you won’t be disappointment and not to mention, wasting an amass of ingredients and/or money. 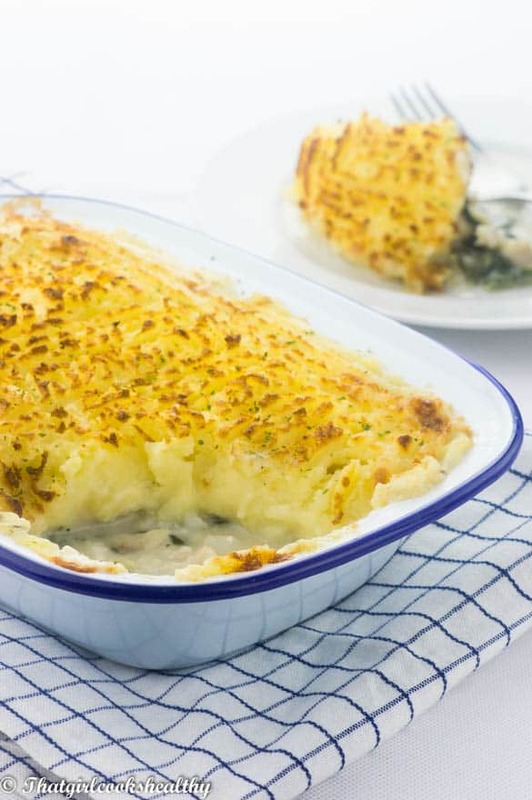 This sweet potato fish pie is full of flavour with plenty of flare, it’s packed with healthy greens thanks to the added bits of shredded callaloo (a leafy green related to spinach). If you’re unable to source callaloo, simply use spinach as this would be a great alternative. The topping is made from Caribbean sweet potatoe which have a red outer skin with white flesh. You won’t find this potato in your local supermarket so head to your nearest Afro-Caribbean market or grocery store to pick some up. It’s suitable for the paleo diet which is a bonus for those who follow this type of lifestyle. What if I can’t find Caribbean sweet potato? No problem! You are more than welcome to use regular old sweet potato which has the orange flesh, if you are unable to source the former. 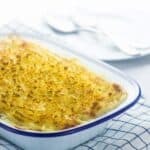 What can I serve the fish pie with? You can serve the sweet potato fish pie with an additional batch of healthy greens or on it’s own. It’s so filling that you will be content with eating it either by itself or with more greens – your choice. 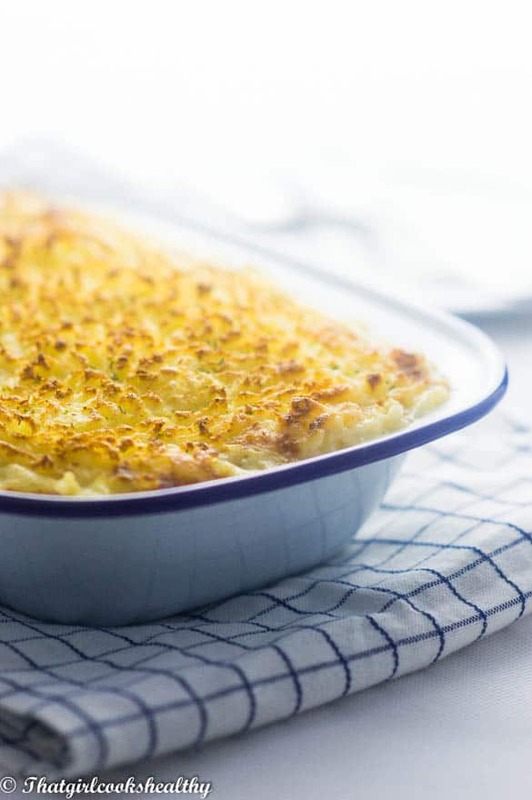 Just don’t forgot to fuel your body with a great source of complex carbohydrate and lean protein with my comforting Caribbean sweet potato fish pie. Bring the sweet potatoes to a boil in a large saucepan until tender. This should take roughly 10 minutes but prick the potato with a fork to determine its readiness. Once cooked drain the water and set aside to cool down for 5 minutes. When the potatoes are completely cool, use a masher to break down the potatoes and incorporate the butter, pink salt, garlic granules and vegan cheese. In another saucepan that is large enough to accommodate the fish fillets, add the coconut milk and thyme, bring to the boil and reduce to a simmer after 2 minutes. Allow another minute for the thyme leaves to loosen from the stem (some will still be attached, but don’t worry) before adding the fish fillets. Poach the fish fillets for 3-4 minutes then use a sieve with a jug underneath to strain off the milk, reserving it for the sauce. Discard the stem of the thyme leaves. 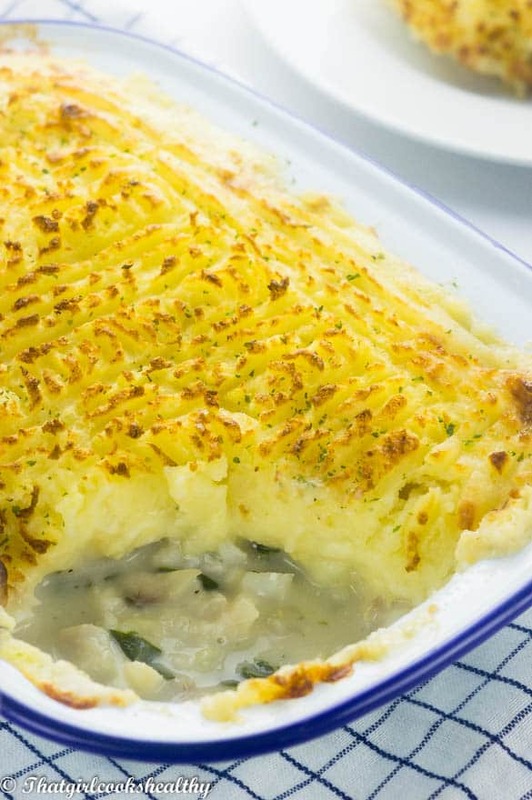 Carefully pour the fish into the pie dish and use a fork to flake and evenly distribute the pieces across the bottom. Pour the coconut milk back into a sauce pan on low-medium heat, now melt the butter and stir in the cheese with the tapioca.watery mixture. The coconut milk to should resemble a smooth creamy sauce . Remove the sauce from the heat and proceed to season with the parsley, onion, garlic granules, black pepper and pink salt. By now the sauce should have thickened. Stir the callaloo into the thick sauce and pour the white sauce evenly over the fish. Place the pie under the grill on medium heat and grill until golden brown.